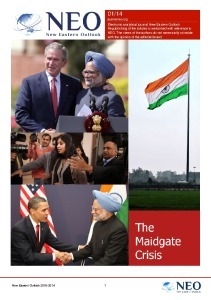 The so-called “Pivot to Asia” serving as the current underpinning of American foreign policy in Asia has been repeatedly exposed as a continuation of a decades-old cynical region-wide US gambit to encircle and contain China while establishing military, sociopolitical, and economic hegemony over China’s neighbors, particularly those in East and Southeast Asia. US proxies have long held power in the Philippines and Japan, while Myanmar has recently found itself under direct Western influence through US-British proxy Aung San Suu Kyi and her army of US-British funded political fronts and faux-nongovernmental organizations (NGOs). Thailand finds itself geographically, historically, and geopolitically at the center of this “pivot.” Historically, Thailand remains the only Southeast Asian state to avoid European or American colonization. 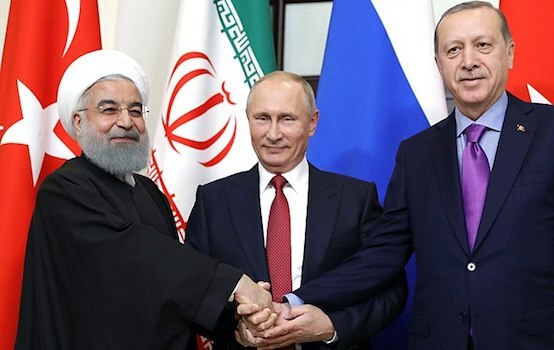 It has accomplished this by striking a delicate balancing act between various opposing hegemonic forces in the region. More recently, it has weathered over 10 years of political instability brought about by US-proxy Thaksin Shinawatra who served as prime minister from 2001-2006, with his brother-in-law and sister served as nepotist stand-ins up to 2014 when finally he and his political party were completely removed from power by a peaceful military coup. During Shinawatra’s time in power, he would serve Western interests well – sending Thai troops to participate in the unpopular and illegal US invasion and occupation of Iraq in 2003, hosting the CIA’s atrocious rendition program on Thai soil, and attempting to ramrod through a US-Thai free trade agreement without parliamentary approval. Since Shinawatra’s initial removal from power in 2006 and up to and including today, he has received unswerving support from some of the largest lobbying firms in Washington including his former Carlyle Group associate James Baker, Barbour Griffith & Rogers, Robert Amsterdam, and notorious Neo-Conservative Kenneth Adelman. It is clear that the US seeks to put Shinawatra back into power, or at the very least, use his political front to divide and weaken Thailand as much as possible to gain additional regional leverage. Thailand now finds itself at the end of a US-European campaign to isolate and shame the nation for dismantling the foreign-backed political networks of Thaksin Shinawatra. Western headlines portray Thailand as an international pariah, when in reality, its increasingly closer relations with Bejing alone equates to the support of a nation that – by itself – represents more people than the US and EU combined. But Beijing is not Thailand’s only potential ally. There is another. 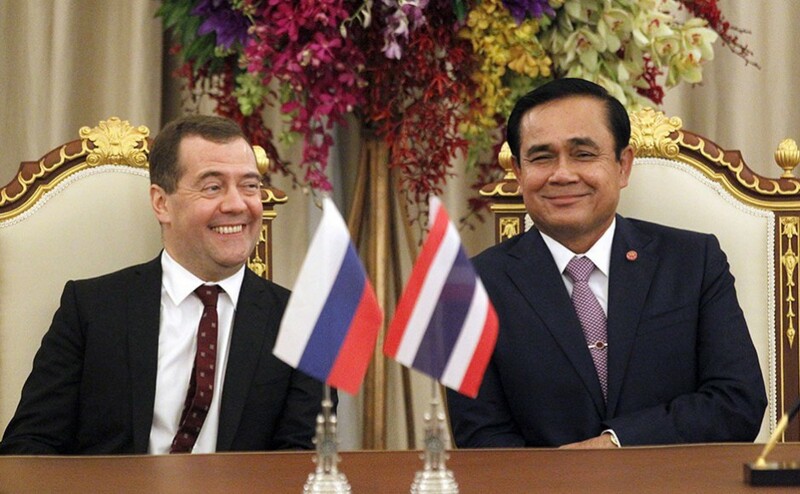 Later this month – May 2016 – Thai Prime Minister Prayut Chan-o-cha plans to visit Moscow personally on what is hoped to be a significant leap forward in Thailand and Russia’s already long-standing relations. The increasingly transparent nature of America’s growing hostility toward Thailand in hopes of putting Shinawatra back into power leaves the Southeast Asian state little choice but to perform a “pivot” of its own. And it is a pivot that has been incrementally manifesting itself since Shinawatra was removed from power in 2006. Today, Russian Mi-17 helicopters have begun to replace US aircraft and now can be seen flying over Bangkok in place of US Blackhawks. 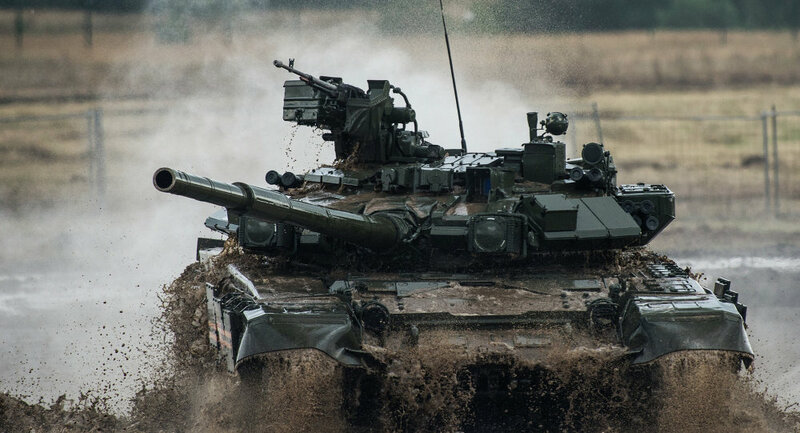 Thailand has also begun replacing its aging arsenal of American M-60, M-48, and M-41 tanks, with serious consideration being given to Russian T-90s which have performed well in Syria against US-backed violence there. Additionally, Ukrainian, Chinese, and domestically-developed armored personnel carriers have begun replacing US M-113s. The pattern developing here is one of US influence being incrementally replaced – and not because Thailand has sought conflict with Washington, but because Washington has given Thailand little choice otherwise. PM Prayut’s visit to Moscow will determine just how much more US influence will be replaced in favor of growing ties with Russia. It is believed that the decision to purchase T-90 tanks will be made then, along with deals involving naval equipment and economic deals involving Thai agriculture. Russia, currently under sanctions by the US and EU, has been forced to look elsewhere for agricultural imports. Thai agricultural products have been increasingly targeted by politically-motivated campaigns in the US and Europe, making them a perfect match for Russia. What is emerging is not the isolation of Russia or Thailand from the “world,” but the isolation of the US and EU. For Russia, expanding its influence as a means of checking US hegemony in Asia is a welcomed development by many. It also gives Asia a choice beyond merely “Beijing or Washington” in favor of instead a multipolar balance that may stave off any one single power from encroaching too far upon the sovereignty of any single Asian state. 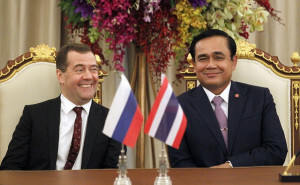 For Thailand, its ability to foster ties with both Russia and China means that despite claims by the US and Europe that it is “isolated” internationally, it has the support of governments who represent more people than the the US and EU collectively – meaning that far from isolated, Thailand is escaping out from under the shadow the US has long cast over Southeast Asia before and after the Second World War, and is finally able to strike a healthier balance of military and economic relations elsewhere. For the United States, Thailand’s ability to circumvent attempts to isolate it represent a failure and a challenge to its claims of hegemony over the region. Just as Thailand’s rebuke of US demands to allow suspected Chinese terrorists to travel onward to Turkey resulted in deadly terrorism in the middle of Bangkok, further challenges to US hegemony are likely to be met by increased political subversion, terrorism, and other methods of US coercion. Of course, Bangkok must not fool itself into thinking that a different course of actions would spare it from such a fate. The US means to transform Thailand into a proxy-state with its institutions destroyed and replaced with those of Washington’s creation, whether Thailand cooperates or not. By building ties with Russia and China and thus strength and independence from Western influence, Thailand at least has a chance to weather US designs – as it has done for centuries against foreign aggression. Closer anti-terror cooperation with Russia and China, may in fact help expose and defeat coercive networks used by the US as part of its true “pivot” to Asia.